Strap yourself into the cockpit of a Virtualoid and grab any weapons you can find because you’re about to battle 50-foot cyborg mercenaries. Take on the massive enemy in 10 different arenas where you have complete freedom of movement including the capacity for flight. Which of the multiple endings you receive will depend on how well you fight. Once you have mastered the ability to make your computerized challengers fall into a heap with ease, try to do the same thing with your friends. 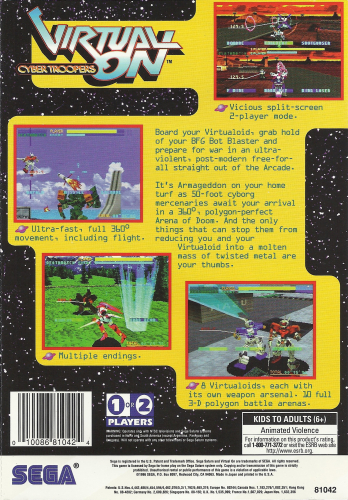 Keep your Virtualoid in one piece in VIRUAL ON: Cyber Troopers.